Chlorella is a microalgae, a nutrient dense "superfood" containing high levels of protein, amino-acids, antioxidants, chlorophyll, vitamins, minerals and enzymes. Both Spirulina and Chlorella are micro-algae. Spirulina is blue-green algae which thrives in many different environments like salt water, fresh water, alkaline water and brackish water from the tropics and up to the North-Sea, while Chlorella is green algae that grows only in fresh water around the world. Chlorella belongs to the division Chlorophyta and is a single-celled organism which just like plants uses the photosynthesis for energy production. Chlorella has a bit more advanced cellular structure than Spirulina by the fact that it’s eukaryotic (nucleus, membrane and mitochondria are present) while Spirulina is prokaryotic (nucleus, membrane and mitochondria are absent). 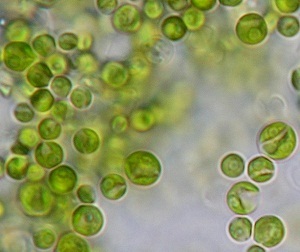 One of its unique properties is a phytonutrient called Chlorella Growth Factor (CGF). CGF - a growth factor in health and nutrition refers to a substance that builds the immune system. Chlorella has the ability to quadruple in quantity every 20 hours, which no other plant on Earth can do. It is programmed into its DNA to do so and it is the Chlorella Growth Factor (CGF) that is responsible for this ability. CGF is made up of many valuable nutritional substances, some of which are not found in any other foods. Chlorella is a nutrient-dense superfood that contains 60% protein, 18 amino acids (including all the essential amino acids), and various vitamins and minerals. It provides all of the dietary-essential amino acids in excellent ratios. It is also a reliable source of essential fatty acids that are required for many important biochemical functions, including hormone balance. Chlorella also contains high levels of beta-carotene and RNA/DNA. More than 20 vitamins and minerals are found in chlorella, including iron, calcium, potassium, magnesium, phosphorous, pro-vitamin A, vitamins C, B1, B2, B2, B5, B6, B12, E and K, biotin, inositol, folic acid, plus vitamins C, E and K.
Chlorella has more antioxidants than spirulina with 5-10 times more chlorophyll than known in any other plant so it works better for cleansing and detoxing. The Chlorophyll cleanses your bloodstream, liver, kidneys and bowel. It has a molecular structure that allows it to bond to toxins in your body and usher them out of your body. All the nutrients the liver needs to carry out this process are found in Chlorella so by removing toxins from your system Chlorella helps to protect the liver from toxic injury. The GreenMedInfo.com's Chlorella research page documents that there are numerous different diseases that it may help prevent or reverse with over 30 studies. According to many studies, chlorella binds with the pesticides, harmful metals, and other harmful substances to excrete from the body. It is also believed that Chlorella stimulates the production of T-cells to boost up the immune system and to coax your body for preventing growth of bacteria and other harmful micro-organisms. Another benefit studied about this natural plant is about its cancer fighting property. Chlorella provides cells with a source of RNA and DNA and it leads to increase in the production of cells. Increased cell production helps to counter the effects of chemotherapy and effects of radiations by boosting the immune system. It helps to remove harmful carcinogenic effects of the harmful medical treatment. In a study published in the June 1996 issue of "Cancer Immunology Immunotherapy," clinicians showed that chlorella extract can minimize the side effects of chemotherapy treatment without affecting the strength of anti-cancer medications. In another study published in the same journal two years later in the February 1998 issue, researchers found that a protein extract from chlorella could prevent the spread of cancer cells in mice. Chlorella is considered to be useful in treating the people suffering from fibromyalgia. In a study published in "Phytotherapy Research" in May 2000, researchers from Virginia Commonwealth University found that chlorella helped decrease participants fibromyalgia pain by 22 percent. Another study published in the May-June 2001 issue of "Alternative Therapies in Health and Medicine," clinicians reported that 10 grams of pure chlorella in tablet form and 100 millilitres of chlorella liquid extract taken daily by fibromyalgia patients felt better with improvement in quality of life. A study by Codif-International in France showed that a cream containing 1 percent chlorella extract increases the skin's firmness and tone. It repairs the underlying cells of the skin and used for giving a glowing skin. It is also useful in preventing the signs of ageing. Studies have shown that chlorella helps to normalize blood sugar. Laboratory experiments have shown that chlorella helps in maintaining normal blood pressure and prevent brain stroke. Study has also been done with chlorella and diabetes, with animal testing showing chlorella to improve insulin sensitivity and provide protection against the chronic effects of the condition, such as vision loss and early cataracts. Chlorella has also been shown to increase the good bacteria in the gastrointestinal (GI) tract, which helps to treat ulcers, colitis, diverticulosis and Crohn's disease. In Japan, it is traditionally used as a treatment for duodenal ulcers, gastritis, hypertension, diabetes, hypoglycemia, asthma, and constipation. Chlorella is now also used as an adjunct supplement during radiation treatment for cancer as its abundance of chlorophyll is known to protect the body against ultraviolet radiation. Krill oil is a nutrient-dense substance extracted from a tiny, bottom-of-the-food-chain crustacean (tiny shrimp like animal) that lives in the icy waters around the Antarctic. In Norwegian, the word “krill” literally means the “whale food”. 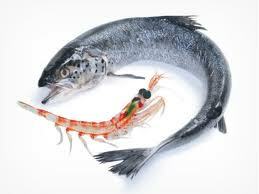 Firstly, krill oil contains exceptionally high amounts of phospholipids than fish oil. Phospholipids are one of the principle compounds in high-density lipoproteins (HDL), which you want more of. Phospholipids massively increase the absorption of the fats – up to 60 per cent - which means less capsules need to be taken to achieve the desired health benefits. People taking fish oil for arthritis, for example, may need to take nine to 14 standard capsules a day, whereas, only one capsule of krill oil is needed for the same effect. Secondly, the plant-based omega-3 sources like flax, hemp and chia seeds are high in ALA, but low in EPA and DHA. DHA is essential for brain and heart health and for lowering the bad cholesterol in the body. The conversion of ALA to far more essential EPA and DHA is dependent on an enzyme called delta 6 desaturase. But elevated insulin levels impair this enzyme, and more than 80 percent of the U.S. population has elevated insulin levels. Thirdly, fish oil is weak in antioxidant content, whereas krill oil is rich in antioxidants as it contains astaxanthin — the most potent antioxidant in nature and contains another essential nutrient called choline. Fourthly, many types of fish are now contaminated with mercury and other heavy metals which are polluting our oceans. Antarctic krill is not subject to this contamination. The GreenMedInfo.com's krill research page documents that there are now 25 different diseases that krill may help prevent or reverse. Reduces blood cholesterol: Research has shown that taking 1-1.5 grams of krill oil everyday reduces the total cholesterol and bad cholesterol and increases the amount of good cholesterol in the blood. Intake of high doses of krill oil also helps in reducing the levels of triglycerides that are also harmful for the heart. The DHA and EPA are naturally present in krill oil and it helps in reducing the risk of heart attack by reducing the levels of blood cholesterol. The omega-3 fatty acids present in krill oil are useful for preventing heart diseases. Reduce cancer risk: In clinical studies it is shown that DHA and EPA reverse cancer growth. It reduces the risk of breast cancer in women. Krill oil contains many anti-oxidants that prevent the damage produced by the free radicals. Brain health: Krill oil is useful for promoting optimal functioning of brain cells. It is also a good option for the normal functioning of the retinal cells. DHA and EPA present in the krill oil are important constituents found in the brain. It is a great supplement for the treatment of depression and other brain related disorders. It helps to maintain a happy mood and reduces the chances of developing depression with regular intake. Anti-inflammatory: The omega-3 fatty acids present in krill oil act as natural inflammatory substances. When inflammation reduces it gives best results for the treatment of inflammatory diseases such as arthritis, PMS symptoms and reduced heart risk. A study conducted by Western University in collaboration with McMaster University was published in the Journal of the American College of Nutrition examined krill oil (300 mg daily) compared to a placebo and found that krill oil was effective at reducing arthritis symptoms and inflammation. Skin protection: Krill oil consists of a substance called astaxanthin that protects the skin from harmful ultra violet radiations of the sun. Due to the presence of this substance krill oil may be used for reducing the risk of skin cancer and other skin conditions that may result due to overexposure to the UV rays of the sun. Immune system: Numerous studies have been done to find that krill oil is beneficial in improving the overall health of an individual by strengthening the immune system. It harmonizes the body by balancing different hormones. Black seed (Nigella Sativa) is popularly known as Kalonji in Indian homes. This herb has been traditionally known for its numerous healing properties. The seeds of the black cumin plant contain over 100 chemical compounds. In addition to what is believed to be the primary active ingredient, crystalline nigellone, black cumin seeds contain: thymoquinone, beta sitosterol, myristic acid, palmitic acid, palmitoleic acid, stearic acid, oleic acid, linoleic acid, linolenic acid, arachidonic acid, protein, vitamin B1, vitamin B2, vitamin B3, folic acid, calcium, iron, copper, zinc, and phosphorous. According to an Arab proverb, nigella sativa is quoted as having the ability to cure all disease except death. 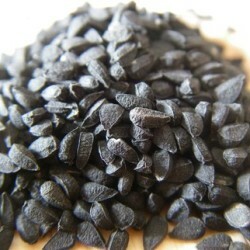 Anti-Cancer: Black cumin or Kalonji is also used in conjunction with cancer treatment. It has shown to increase bone cell marrow production by up to 250% and inhibit tumour growth by as much as 50%. Kalonji stimulates the bone marrow to increase the production of interferon, and protect the normal cells against harmful effects of viruses, destroy tumour cells and increases the number of anti-bodies that produce B cells. Researchers at the Cancer Immuno-Biology Laboratory in South Carolina found that black cumin helps stimulate the activity of neutrophil granulocytes, the most abundant type of white blood cell in the body, which are responsible for targeting cancer cells and eliminating them before they can develop into tumors. Researchers at Thomas Jefferson University in Philadelphia have discovered that an extract of nigella sativa seed oil, known as thymoquinone, can remedy one of the most virulent and difficult to treat cancers: pancreatic cancer. The extract does this by blocking pancreatic cell growth, and actually enhancing the built-in cellular function that causes programmed cell death, or apoptosis. Cell studies have found that black seed extract compares favorably to the chemoagent 5-fluoruracil in the suppression of colon cancer growth, but with a far higher safety profile. Animal research has found that black seed oil has significant inhibitory effects against colon cancer in rats, without observable side effects. Studies have shown that regularly taking black cumin or black cumin oil can help prevent the growth and spread of colon cancer cells, but the seed is also useful in preventing and treating many other types of cancer as well. Asthma & Allergies: Kalonji is one of the best herbal remedy for respiratory problems such as asthma and allergies. It helps in the synthesis of prostaglandin E1 that suppresses the release of allergic messenger agents and boosts up the immune system. In a Munich study doctors had 70% of patients who had various allergies (including dust, mold, asthma, and neuro dermatitis) recover with no symptoms after using Black Cumin. A study at Harvard University showed that you will see best results in the treatment of these problems with continued use of 3-4 drops of Kalonji per meal for six months or more. Immune System: In 1986, Dr. El-Kadi and Dr. Kandil conducted a study with human volunteers to test the efficiency of black seed as a natural immune enhancer. The first group of volunteers were given black seed capsules (1 gram twice daily) for four weeks and the second group were given a placebo. A complete lymphocyte count was done in all volunteers before and four weeks after administration of black seed and the placebo which showed that the majority of people who took black seed displayed a 72% increase in helper to suppresser T-cells ratio, as well as an increase in natural killer cell functional activity. The control group who received the placebo experienced a net decline in ratio of 7%. They said, "These findings may be of great practical significance since a natural immune enhancer like the black seed could play an important role in the treatment of cancer, AIDS, and other disease conditions associated with immune deficiency states." Many other studies have determined the effect of Kalonji in enhancing immune system especially in immune compromised patients. Diabetes: According to College of Medicine, King Faisal University, Dammam, Saudi Arabia, two grams of black seed a day resulted in reduced fasting glucose, decreased insulin resistance, increased beta-cell function, and reduced glycosylated hemoglobin (HbA1c) in human subjects. Cinnamon is a flavorful ingredient used in a variety of food items around the world. Apart from its palatable zesty flavor which is used in both sweet and savoury foods, cinnamon has been used traditionally as a herbal remedy for many health problems. According to Memorial Sloan-Kettering Cancer Center (MSKCC), cinnamon possesses antimicrobial, antioxidant, anti-inflammatory and immune-stimulating properties which can be useful for a variety of ailments. Because of its numerous health benefits, you may want to use this herb more generously in your daily life to bring about the wellness it has to offer. 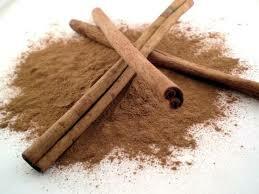 Diabetes: Cinnamon is an important herb for the people suffering from diabetes type II. It is a well known herb for diabetes because it boosts the activity of the insulin naturally. Even if cinnamon is taken in very low quantity it can boost the activity of the insulin to a great extent and control blood sugar level. A 2003 study carried out in the US Department of Agriculture revealed that Diabetes type II patients in Pakistan, who had taken at least a pinch of cinnamon in their daily diet, had considerably low levels of blood sugar level. Heart Disease: Cinnamon is a wonderful remedy for safeguarding the heart and associated arteries and prevents them from damage and infection due to presence of anti-inflammatory properties. Cinnamon lowers the bad cholesterol level and prevents clogging of the arteries. It is a great anti-inflammatory herb that prevents inflammations of the heart tissue and prevents heart attacks. Colon cancer: Cinnamon is a very good herb in preventing colon cancer and symptoms associated with irritable bowel syndrome such as constipation and diarrhoea. Cinnamon provides fibre that combines with calcium and sticks to the bile salts and reaches liver for elimination. This prevents chemical damage caused to the colon cells by the bile. Arthritis: It posses anti-inflammatory properties. In a study conducted at Copenhagen University, the arthritic patients were instructed to take a combination of half a teaspoon of cinnamon powder and one tablespoon of honey every morning before breakfast. These patients not only felt great relief from the pain after seven days but also showed great movement of limbs and joints without difficulty after one month. Anti-cancer: Research at the University of Texas, published in the journal Nutrition and Cancer, has shown that cinnamon can reduce the increase in cancerous cells in the body and it holds promise for cancer prevention when included regularly in the diet. Cinnamon also helps reduce the growth rate of leukaemia and lymphoma cancerous cells. Neuro-degenerative disease: Cinnamon also helps in reducing the inflammation of the brain meninges, thereby preventing from many neuro-degenerative disorders such as Alzheimer’s disease, Parkinson’s disease and meningitis. According to a study conducted at The University of Texas in the Department of Experimental Therapeutics, cinnamon has powerful and natural ingredients that may curb or delay the onset of a variety of neurodegenerative diseases, including: Brain tumors, Alzheimer’s, Parkinson’s disease and meningitis. Brain function: Research has shown that aromatic power of this herb can stimulate cognition and mental alertness. It also helps to soothe brain and produce calming effect to reduce anxiety. Cinnamon tea is very effective in eliminating the anxiety before exams in children. Blood thinning: Cinnamon consists of a substance called coumarin that has blood thinning properties which also helps in improving the circulation of the blood. 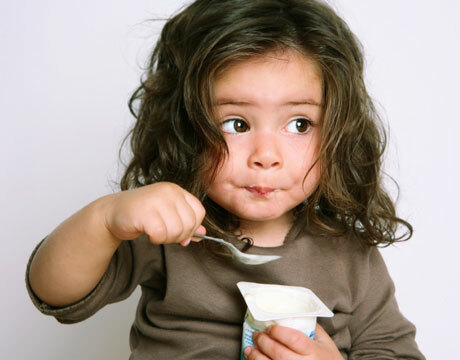 If you are parenting a toddler, then you must be concerned about the types of food that your child should be eating. Toddlers grow rapidly and they want your attention and dependence at this age. As a parent, your duty is to provide right type of food at the right time for proper development of your child. Fruit juices, soft drinks are high in sugar and not good for toddler health. These drinks will fill them up and will leave less appetite for other nutritious food. Moreover, these drinks can also lead to dental caries, excess weight gain, diarrhea, and poor nutritional intake. You can start giving water or milk in a glass and stop the use of bottles after your child reaches one year of age. Water and milk are the best drinks for your toddler. It is an important source to fix the required sugar as it is a natural fruit. Researchers at the USDA Human Nutrition Center (HNRCA) have found that blueberries rank first in antioxidant activity when compared to 40 other fresh fruits and vegetables. Anti-oxidants help to eliminate harmful free radicals that can lead to cancer. You can include raspberries, blueberries in different forms to give good supply of anti-oxidants to your toddler. It is one of the best sources of calcium and protein for your toddler. It helps to support immune system and helps their digestive system to function normally. This vegetable is not very popular among kids but it provides many health benefits. It is rich in two powerful substances that help in preventing cancer. It is packed full of vitamins E, C and K. It is a good choice to supply potassium and beta-carotene to your child that are necessary for performing important functions. These are rich in fiber magnesium and iron. These also contains high amount of potassium that helps your kidneys, nerves, heart and muscles to function normally. It is one of the most nutrient rich foods available. They are rich in vitamin B group and also provide vitamins A and D. Egg yolk is an important source of riboflavin, B12 and choline (a nutrients required for rapid brain development). It also supplies Omega 3, which is good to boost energy. Garlic is known for ages as a natural herb as it possesses anti-viral and anti-bacterial properties. It helps to boost the immunity of your child and prevent recurrent attacks of colds and coughs. It also has some anti-cancer properties that prevent different types of cancer. Peas are full of group B vitamins, vitamin C and some minerals such as iron, manganese and phosphorus. It also helps in maintaining normal blood sugar levels. It helps to increase the concentration and prevent diarrhea in children. Spinach is a powerhouse of different nutrients. It is loaded with calcium, iron, vitamin K, folic acid and bioflavonoid. Other green leafy vegetables such as kale, collards, turnip green also belong to this category and good for healthy development of your child. Sleep has an enormous impact on our daily activities. If you do not get good sleep it may affect your work, concentration, mood and social interaction. After a good sleep you feel fresh and restorative to function properly. Sleep needs vary depending upon age; in general 7-8 hours sleep is adequate for normal functioning of body. If you feel tired the next day, it means you are not getting adequate sleep. Babies and children require more sleep than adults. It is a myth that older people require less sleep. As the age advances sleep requirements change and old people tend to suffer from several sleep disorders. What helps us to get good sleep? "When you're sleep deprived, your body produces more ghrelin, a hormone that tells you to eat more, and less leptin, which signals you to stop eating," says Michael Breus, PhD, author of Beauty Sleep. It is recently found by a study done at the University of Chicago that people who sleep less than seven to eight hours are likely to eat high-carb, sugary and starchy food over other healthy foods. It is also a true fact that if you choose certain healthy foods these calms your nervous system and initiates a hormonal response to induce sleep. "A big meal increases the blood flow to your digestive tract, causing your stomach to secrete more gastric acid and making your pancreas and intestinal muscles work harder," Breus says. This stimulates your system instead of calming it. Eating nutritious food helps to maintain a balance of hormones and neurotransmitters that induce good sleep. 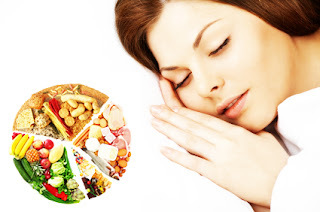 A diet including foods rich in vitamin B complex, calcium and zinc help you to rest better. "Vitamin B6 signals your body to produce the calming hormone serotonin," Breus says. "And calcium and zinc are natural relaxants." It is found that avoiding caffeine can improve the sleep quality, found in a study published in the Journal of Clinical Nursing. Milk is a rich source of tryptophan, which is an essential amino acid that naturally induces sleep. Tryptophan enhances the amount of serotonin, which is a natural sedative for our brain. A glass of warm milk with one teaspoon of honey can facilitate good sleep. A banana with milk provides your body with vitamin B6, which converts tryptophan to serotonin and helps in inducing sleep. Many herbs are found to be useful for inducing good sleep. One such herb known since ancient time is valerian. Valerian: Researches have shown that the active ingredients present in the valerian root relax the central nervous system. It does not produce dependency or hung over feeling. Valerian enhances the action of the neurotransmitter GABA (gamma amino butyric acid), which acts to calm us down and make us sleepy. 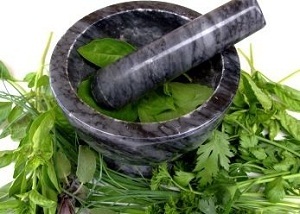 Other herbs include chamomile, peppermint, passion flower, and wild lettuce. Lycopene: It is a cancer fighting anti-oxidant and is easily available from watermelon, pink grapefruit and tomatoes. Vitamin C: It is also an anti-oxidant that may be obtained from strawberries, orange, lemon, Amla and kiwi. Melatonin: This is a hormones secreted by the pineal gland situated in our brain and plays an important role in inducing sleep. It can be easily found in foods such as chia seeds. Foods rich in protein such as soy beans, meat, yogurt consists of serotonin that helps in inducing sleep. Coconut is an excellent food source to boost up immunity as it has anti-viral, anti-bacterial, anti-fungal and anti-parasitic properties. It is an excellent natural food for preventing from diseases such as influenza, herpes, urinary tract infections, gonorrhoea, bronchitis and many other such ailments produced by microbes. Research shows that Alzheimer’s diseases results from an inability of the brain to process glucose, which leads to cell death. But brain has another source of energy, ketones which are produced from mid chain triglycerides present in coconut oil. A Florida doctor was able to reverse her husband's Alzheimer's disease just by giving him four teaspoons of coconut oil per day. In the course of a year he not only regained the ability to exercise and to care for himself, but his brain atrophy was completely halted. Eating coconuts also supports normal development of strong and healthy bones and teeth. It helps body to absorb calcium and magnesium properly. It is an excellent food that prevents osteoporosis. It is a healthy alternative for individuals who are lactose intolerant and want to keep their bones and teeth healthy. There are different coconut products like coconut water, coconut oil, coconut flour, coconut meat and coconut kefir which have a variety of health benefits associated to them. It is a clear fluid that is present inside the whole green coconuts. Coconut water is a health drink as it contains 60 calories, no fat, a gram of protein and about 15 grams of carbohydrates. 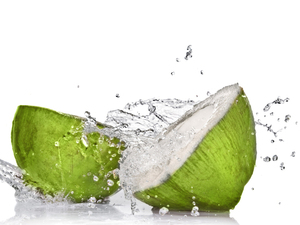 Many athletes are using coconut water to replenish lost water, minerals and glycogen during heavy exercise. It is an excellent source to hydrate body without depleting important minerals. A study published in the West Indian Medical Journal looked at whether coconut water is effective in treating high blood pressure which found that coconut water helps in lowering cholesterol and due to the presence of potassium it also helps in controlling blood pressure. It is also used for best hangover prevention. It gives amazing results if you drink coconut water after having two or three drinks. Coconut water was also extensively used in the pacific during World War II. Since blood plasma supply was scarce, it was commonly used by the doctors to siphon pure coconut water from young coconuts to be used as emergency blood plasma transfusions for the injured soldiers. In the 1940′s farmers tried coconut oil to fatten their animals but discovered that it made them lean and active and increased their appetite. Many studies have been done and it is found that coconut oil helps in weight loss. It consists of a type of fat called as medium chain triglycerides which are differently metabolized than other oils. Coconut oil helps to increase good cholesterol that is HDL- high density lipoproteins and also adds anti-oxidants in your body to prevent the damage produced by free radicals. It helps to detoxify your skin and offers hydration and antioxidant benefits that help you to look healthy and young. It also helps to slow down the process of ageing by providing antioxidants. Another important benefit of coconut oil is that it helps in protecting teeth from bacterial infection that may cause cavities. Simply rub teeth with fresh coconut oil and it helps to make your teeth stronger and healthier. Coconut oil is also used in vegetable shortening, non-dairy creamers, baked goods. It is also used in shampoos, lotions, soaps and other cosmetics. Coconut kefir, is also known as drinkable yoghurt. It is fermented with probiotic bacteria and is used to improve digestive functions. It also helps in boosting up the immunity and helps in weight management. Coconut flour is an effective alternative for diabetic individuals. Studies have shown that coconut flour may be added to baked items to lower the glycemic index in diabetic patients. The creamy coconut meat that lines the interior of the nut’s hard outer shell is eaten raw or used to flavour ice-cream, confectionary products and baked goods. Dried coconut meat, or copra is rich in fat which is known as lauric acid. This type of fat is easily absorbed by the human body and is used to obtain quick energy. Everybody is well aware about the old saying “An apple a day keeps the doctor away” which is literally true. Apple is an extremely important fruit for maintaining good health. Apple is also one of the dirtiest of fruits when it comes to pesticide exposure, therefore; the best choice is to go for organic apples. Even otherwise, if by any chance you are not able to lay your hands on the organic varieties, it is not healthy to exclude these items from diet all-together either. As the Environmental Working Group says, "The health benefits of a diet rich in fruits and vegetables outweigh the risks of pesticide exposure." 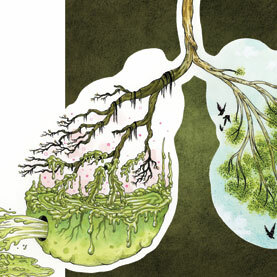 Our body cells may be harmed by unwanted free radicals that are formed through natural processes. Anti-oxidants are the substances that help to destroy these harmful substances in our body and prevent our body against many harmful health problems. There are many fruits and vegetables that contribute anti-oxidants in our body for eliminating the effect of free radicals and apple is one of them. Aging is a natural process and we cannot stop it but we can delay it by eating healthy food. Many studies are being done at various research institutions. One such research is done at the U.S. Department of Agriculture's Jean Mayer Human Nutrition Research Centre on Aging based at Tufts University in Boston, Mass., links the consumption of diets high in anti-oxidants with reduction in physical and mental changes associated with aging. The Tufts scientists in collaboration with colleagues from Colorado and Pennsylvania published their evidence in Brain Research in the June 2, 2000 issue that age related issues can be reversed by eating nutritious food. Apples are ranked higher to initiate such a response. French researchers, writing in the October 1996 issue of Carcinogenesis and the June 18, 1998 issue of Mutation Research, gave their input about the inhibitory effects of dietary phenolics on the development of carcinogenic substances in the bladder. They concluded that smokers ingesting dietary phenolics mainly flavonoids can greatly reduce the harmful effects of tobacco carcinogens within their bladder cells. Important foods that provide flavonoids include apples, lettuce and onions. Scientists at the University of Hawaii's Cancer Research Centre of Hawaii in Honolulu investigated relationships between flavonoid intake and lung cancer risk. They wrote in Journal of the National Cancer Institute in its January 19, 2000 issue that "we found statistically significant inverse associations between lung cancer risk and the main food sources of the flavonoids quercetin such as apples and onions." They concluded that "if replicated, particularly in prospective studies, these findings would suggest that foods rich in certain flavonoids may protect against certain forms of lung cancer." Apples are good for maintaining your heart healthy. It contains a good amount of pectin, the soluble fibre that helps in lowering LDL, the bad cholesterol in our body. But the most important health benefit of apples is the mix of anti-oxidants present in it. Flavonoids such as quercetin prevent to oxidize LDL to a more dangerous form. Researchers say that half glass of apple juice per day can significantly reduce the oxidation of LDL. Chronic obstructive pulmonary disease is a life threatening respiratory disease in which a person gasps for breath. Dutch scientist’s studies if the flavonoids present in food compounds can help to ease the COPD symptoms. 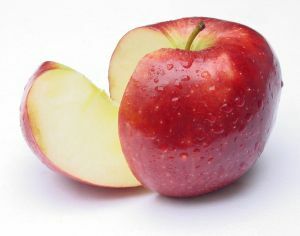 Apples were the primary sources of flavonoids. Results showed excellent results and lowered the incidence of coughing and breathlessness in COPD patients after consuming apples. The researchers stated in the July 1, 2001 issue of American Journal of Respiratory and Critical Care Medicine, "Solid fruit, such as apples, intake was beneficially associated with COPD. Consuming apples can help you to prevent wrinkles on your skin. It is revealed by an article published by Australian researchers in the February 2001 issue of Journal of the American college of Nutrition. It was revealed that eating apples can greatly help in saving money for cosmetic surgery. A chemical compound called as procyanidin B-2 is present in the apples. Japanese researchers studied its effect on hair epithelial cells in lab animals and published their conclusion in the January 2002 issue of British journal of dermatology. They stated that this compound which is present in apples promotes hair growth. Apples have long been called nature’s toothbrush; tough they don’t actually cleanse the teeth, they still help to maintain dental hygiene. Biting and chewing an apple stimulates the gums and the sweetness of apple increases the flow of saliva, which help in reducing tooth decay by lowering the levels of bacteria in the mouth.